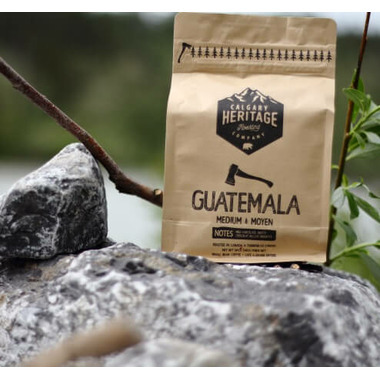 View all products by Calgary Heritage Roasting Co.
Calgary Heritage Roasting Company's medium roast, single origin Guatemalan is a delicious Direct Trade whole bean coffee with a medium body. Smooth and easy drinking this coffee will boast tasting notes of milk chocolate, caramel and cherry. Roasted in Canada. Notes: unmistakable hint of milk chocolate, caramel and cherry with a creamy finish. Directions: use 60 Grams per 1 litre of water or 2 tablespoons per cup. My all-time favourite coffee. Absolutely delicious.